Plenty of claims that value investing no longer works – a factor no longer likely to generate excess returns. Even those who think it is cheap, consider it a trade not worth risking. As a client said to me recently ‘holiday in value, work in growth’. If I understand him correctly this means value only performs every so often. Cheap stocks have been performing poorly. Even cheap stocks receiving upgrades have been performing poorly (worldwide issue). Those who felt value would bounce when the yield curve became upward sloping are now pointing towards a downward sloping curve – further delaying value’s recovery. Investors who are sympathetic to value worrying that, ‘ahead of a recession and a bear market’ it is no place to invest. Let’s look at each of those points and see if we can provide some hope. We think there’s plenty. I would argue that value investing has worked – and I would argue will continue to work – primarily for behavioural reasons. Investors love stories and are happy to (incorrectly) extrapolate trends to excess in preference to assuming facts change. This extrapolation drives share prices to extremes in both directions. Buying when others are selling – and against such an obvious narrative – consumes a serious amount of career risk units and is a very uncomfortable position to take. Simple yes, easy, no. Things are really getting bad if investors are almost too embarrassed to try and profit from stocks looking excessively cheap! The risk of failure clearly haunts them. Why are they not as, or even more scared, of losing money playing in favour of trends? Even history is being rewritten now. Value investing has an extraordinarily long-term track record. And it has worked for extended periods rather than just in short sharp spurts. There is lots of academic evidence to support this, but as back tests, at best, get a polite smile, let’s look at real life. Two books by value investors with detailed performance histories are John Neff on Investing (by the man himself) and Anthony Bolton’s Investing with Anthony Bolton. Neff outperformed the S&P 500 in 20 out of 32 years between 1964 and 1995. (It might be of nothing more than statistical interest but Neff outperformed the S&P 500 in1974 the worst year during that period falling 16.8% relative to26.3% and then again in 1975, the best year, rising 54.5% relative to 37.1%. Similarly, Bolton, between 1980 and 2005, outperformed the FTSE All-Share Index in 19 of 26 years which included 13 years in which he outperformed by at least 10%. Bolton’s longest stretch of successive annual outperformance was seven years whilst Neff managed six years. Hardly flash-in-the-pan type success. In their books, both highlight periods during which there were significant doubts in the market about the continued relevance of value investing. Those periods were followed by significant outperformance. It is very true that cheap stocks performed poorly last year, even in a year when the market was weak. This was probably because those stocks were mainly cyclicals and given investor concerns as the year progressed over weaker economic growth, even low valuations were not sufficient protection. Some US market data from Alpha Architect illustrates this well. 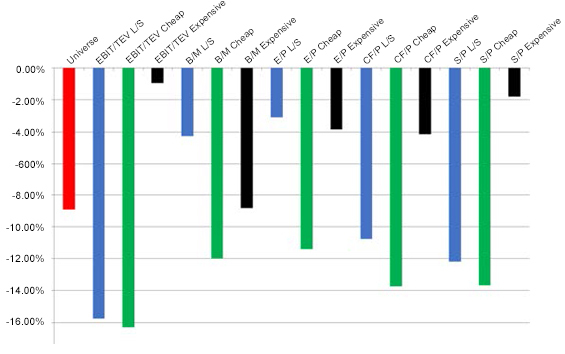 The green lines show that all the various value factors (EV/EBIT, price/book, price/earnings, price/cashflow and price/earnings) performed poorly over the year. This too is part of the ‘fun’ of value investing: even when stocks appear very cheap, they can sometimes become even cheaper. The under performance of cheap upgraded stocks is an even tougher one to rationalise. Perhaps the companies receiving upgrades were cyclicals and investors simply believed it was the final upgrade. Perhaps it just illustrated demand for value stocks was extraordinarily low. Mark this dynamic down as bizarre. With strong economic growth and a few signs of building inflationary pressures, the yield curve was becoming steeper part of the way through 2018. However, this was reversed towards year-end as investors became nervous about the end of the economic cycle. For those who believe A causes (or is correlated with) B then a yield curve in danger of inverting (yields higher at the short end than the longer end) is no time to be buying value. The shape of a yield curve can however change very quickly. It’s always dangerous to write value off, particularly after periods in which it has struggled…regardless of whether markets are falling. To take just one stock example (of many) during the Global Financial Crisis, Next bottomed in absolute terms in July 2008 at a time when the FTSE All-Share Index had fallen 21% from its peak. By March 2009, the FTSE All-Share Index had fallen a further 35%, but Next had risen 32%! That sums up today’s position perfectly.